Finding Wonderland had a fun contest to collect snappy answers to the question: "Where do you get your ideas?" As luck would have it, they chose one of my suggestions (the one meant to sound the most pretentious) to immortalize in cartoon form. Score! If only it were that easy. 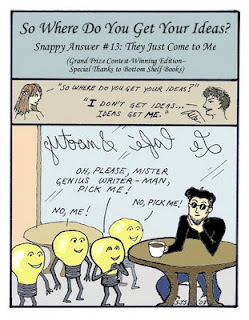 The last time I sat in a cafe and the lightbulbs started talking to me was in college... but instead of giving me ideas, they gave me a strange headache for the next two days. Also, I could never rock a beret like that... and only in my dreams would I be able to grow that kind of beard. Thank you, Sarah, for drawing me as the man I could never be.